This weekend I had the pleasure of speaking at Simmons College in Boston. One of the perks of speaking at these functions is being able to attend other artist/author talks and workshops as well. The only drawback is usually finding myself fighting off headaches from so much mental stimulation. My panel was held on Saturday morning. 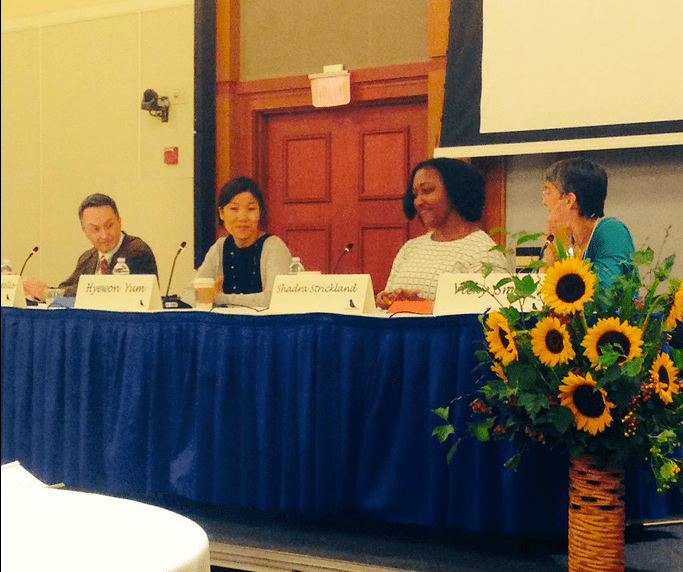 I laughed and shared with Vicky Smith, Hyewon Yum and David Costello on the theme of “homecoming” in our work. Hyewon and I went to SVA together and hadn’t seen each other in over six years! It was a definitely felt like home for me. 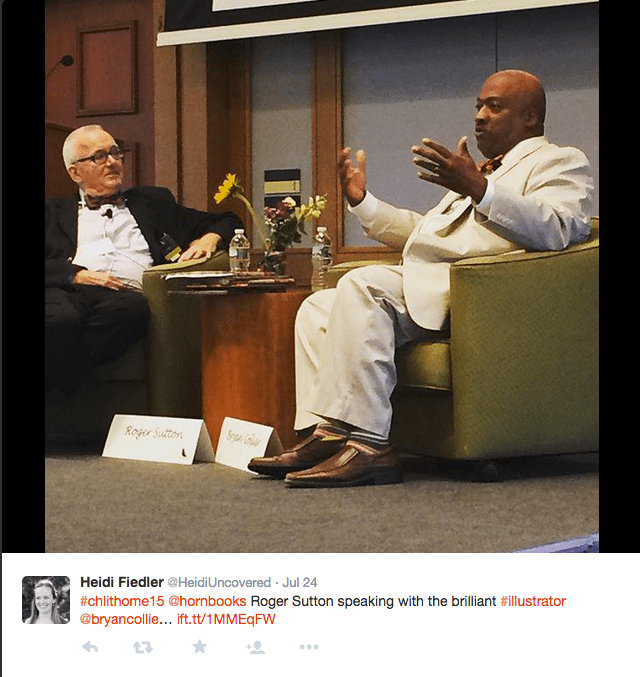 The first talk was an interview between Roger Sutton and Bryan Collier. I have seen Bryan present a few times, but this was the first time I heard him talk about his work led by specific questions. I took terrible notes throughout, but one idea that bubbled to the surface during their conversation was that of making books that feature African American characters (or other minorities, for that matter) experiences universal for all readers. What does make work universal? This is something that I grapple with sometimes in my own work. In my observation, many, if not most well known African American illustrators of note work representationally. The characters portrayed have realistic facial features and are typically rendered in a way that is true to life. Most of the people who work in this vein are celebrated by librarians, parents, and children alike. Why are we so impressed with the ability to render realistically? Is there no room for alternative ways of interpreting ourselves and stories? In contrast, many non-black illustrators do take liberties with characters. There is usually some amount of characterization that happens when rendering human characters that removes us from reality and immerses us completely in the imagination of the story. This is freeing because the rules of everyday life can be manipulated more readily. When working with “real” people, the room for error is greater. No one will question an eye being too far to the left if that eye is made up a simple line and a dot, but if that eye becomes too complicated and realistic, we immediately notice the flaws. I have noticed also though that when many white illustrators include black characters in their stories, they freely simplify and generalize in a way that African American illustrators typically do not. Ezra Jack Keats’ is a great example of this in his portrayal of Peter and his family. Peter is probably the most loved black boy in picture book history. By simplifying Peter’s features we are able to project ourselves freely onto his generic “childness” without getting caught up in the specificity of his blackness. Is this why the character is so universally cherished, loved, and remembered? When I asked Bryan what he thought about this idea in his own work, he said that he wanted the beauty in his [black] characters to be undeniable and to make his books universal through the beauty of those characters. Before I became a famous illustrator (chuckle), I thought that the only work that I could make had to sit closely alongside, if not directly in line with realism. Most of my work in college was painted directly from photographs, which was limiting and did very little to help strengthen my personal voice as an artist. The work that hung on Coretta Scott King Award posters was work that lived in that box. I wanted to be on that poster one day and I sought to make that type of work as well. For now, that way of representation works for me and the stories that I am telling. I doubt that every book will follow the same rule. imaginative revelation for me. And I have loved all things Leo and Diane Dillon. The ideas of blackness in those books broke the frame a bit of what I came to expect from African American picture books. In those artists, I saw more whimsy, humor, and playfulness. Kadir Nelson’s stylized characters in Dancing in the Wings also spoke to me. Yes, the characters lived and breathed realistically on the page, but they didn’t look like photographs. Bodies were elongated, similar to that of Ernie Barnes, and Frank Morrison, and facial features were stylized. A few years even later, I discovered the work of Sean Qualls. His work drew me in because of the fine art quality of his paintings. His characters didn’t look heavily referenced which allowed so much more room for expression. Greg Christie’s work sits more in the middle. The characters look like real people, but are distorted enough that he can use them for maximum expression without getting hung up on rules of realism. 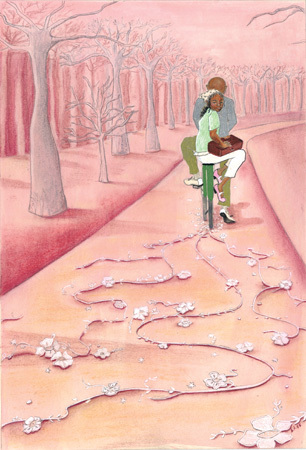 Moving in a another direction is the work of artists like Theodore Taylor III and Vanessa Brantley Newton. Both of these artists work in caricature, leaning more towards what we would see in animated films and comics. Shane Evans has also explored work that is flatter and more stylized. His earlier work was more painterly and realistic. With that being said, when does work about people of color become accepted as universal? Does the work have to be rooted in the continued narrative of pain suffering, and overcoming great obstacles or is there room for recognition and celebration for those books that celebrate joy of intrinsic ethnicity? Why isn’t the reality of everyday blackness in the hands of black artists as accepted as it is in the hands of others? Up and comer Christian Robinson is taking off where Keats left off. The work is deceptively simple, charming, full of fun, but also very well designed referencing greats like Ezra Jack Keats and Bruno Munari. And what about me? For now, I am doing what I love, which is using many artistic voices to tell stories. My work (like my life) does tend to lean more towards magical realism. I love drawing real faces and people…as a child, that was the only work that struck me in museums. I took it seriously. When I was able to draw a face exactly the way it looked in a magazine, friends and family thought it was magic. That has still stuck with me. But as I grow I realize that drawing a character exactly the way he or she looks in real life doesn’t mean they are more or less believable than one that is stylized. Art is a great multifaceted language of design, color, composition, rhythm, pattern, etc. There is much to explore! Thank you for this post and the question you posed at Institute–Bryan’s point is well-taken, but I agree it’s also so important to explore and play in art and story. Loved hearing you talk about your work! Thanks. Every artist has their own agenda and personal preference. I just wonder if, because of our tradition in representation, we haven’t given ourselves permission to be more playful. I hate I didn’t get to say hello to you! Grab me next time. Those things are always such a blur. Thank you Emily. It was a great weekend! Really enjoying getting to know you and the work that you do. Your voice comes shining through in classic tones that are fresh and vibrant. I am an aspiring children’s author and hope to meet you one day at a conference or possibly as a collaborator on a book. Keep the encouraging, REAL, words coming because we’re out here and we’re listening. Your work is so beautiful. I am going to sign up for your Picture Book class on Craftsy. I feel I have so much I could learn from you in the way of drawing – how much detail? Color? Emotion? I am 76, supported a large family with my freelance writing for over 50 years, am now retired and delighting in the drawing I never before had the chance to dig into. You have touched and inspired me.